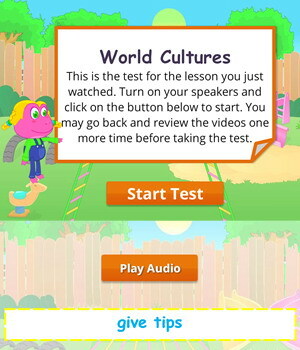 This ESL lesson aims to teach kids words and expressions related to different cultures. The lesson teaches basic cultural taboos in different countries and students learn how to give advice when visiting another country. The lesson’s grammar focus is on adjectives followed by ‘to’ which is part of the verb in the infinitive, and the modal ‘should/shouldn’t for making cultural recommendations. The worksheets below are useful for offline and classroom activities. These printable exercises directly correlate with the above lesson 'World Cultures'. Every worksheet comes with an answer sheet on the second page for educators. Freddie and Bob are watching TV when a program about world cultures comes on. They learn that Japanese people bow as a form of greeting and it is polite to return a bow. Freddie and Bob find these cultural tips fun, and take turns practicing them. It is polite to bow in Japan. It is normal to eat with chopsticks in most Asian countries. It is rude to stick your chopsticks upright in a bowl of rice in China. It is polite to say sorry when you bump into someone in Canada. It is rude to touch someone's head in Thailand. It is impolite to point your finger at someone in most cultures. It is offensive to give tips to waiters in Japan. It is nice to leave a 20% tip to waiters in the USA. It is bad to offer someone a clock for a present in China. 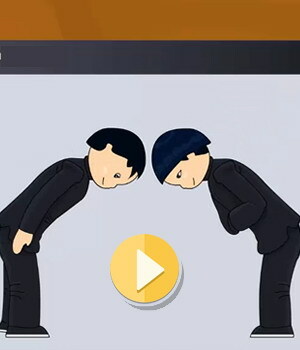 You should bow when someone bows to you in Japan. You should say sorry when you bump into someone in Canada. You shouldn't touch someone's head in Thailand. You shouldn't point your finger at someone.